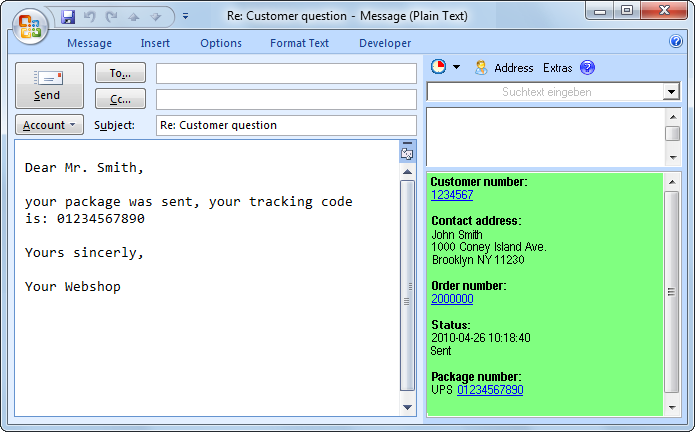 PlentyMarkets + Outlook + Text Modules = ReplyButler! ReplyButler has many useful features for users of plentyMarkets (and other shop/CRM systems). When answering an e-mail, you'll automatically be shown status information about that e-mail. For plentyMarkets these are name, address, previous orders with their status and tracking codes. (Each with clickable links leading to the respective page in your shop system or the package delivery company website.) For other CRM systems this can be any webpage (it is queried dynamically). Img.1: PlentyMarkets data automatically in the text modules (left) and the info window (right). Text modules can do more than insert static text. They can also insert dynamic data from the internet, that was queried for the current e-mail. For plentyMarkets for example the tracking code for the most recent order of this customer. This allows you help the customer quickly and a precisely. ReplyButler has hotkeys for the internal shop pages of your customer (Ctrl+Shift+1) and his most recent order (Ctrl+Shift+2). They work when answering an e-mail and when reading an e-mail in the Outlook main dialog (observing which e-mail is currently selected) and open a browser window with the right page. Furthermore you can configure your own URLs, These URLs can even receive the current e-mail address, customer or order number as parameter, leading you to right profile page on your website. Just enter your domain and your PlentyToken in the options and ReplyButler is ready for you.